Oli Matthews is a freelance Musician and Composer based in the East Midlands. He trained in Classical, Jazz and Folk music and so he works in many different styles which are reflected in the compositions he writes. Today Oli performs mainly on the Folk and Jazz scene, playing at many festivals in the U.K. and across the world. Over the last few years he has played with top rated musician such as: James Fagan, Andy Cutting and Simon Care as well as composing for Paul Sartin, Rob Harbron and Ian Stephenson. 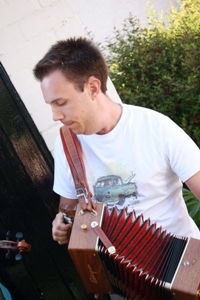 The majority of Oli’s gigs consist mainly of Ceilidh bands and Concert ensembles playing a range of instruments such as Saxes, Clarinet, Melodeon, Cajon and Whistles. As a multi-instrumentalist playing with his regular bands, he has also played with Ceilidh Bands such as Hekety, Peeping Tom and Steam Chicken. The main bands and ensembles that Oli works with on a regular basis are: Cupola, Cupola:Ward and the Kirsty Bromley Band performing at Folk Clubs and Concert venues at Festivals, and DanceCupola, Triptych and Mine’s a Pint Ceilidh Bands playing at Ceilidh series and Festivals alike across the country. To find out more information on any of the bands Oli plays with, please click on the links or visit the Bands page for more information. On the Jazz scene Oli has recently performed on the “Komposit” project with many professional artists, composed by Cheryl Frances-Hoad. This piece was based around complex Indian rhythms but with a strong element of Free Jazz with many Improvisatory elements. The piece entitled “Triptych for Six” was written for Saxophones, Trumpet, Flute, Bass Guitar, Drum Kit and Tabla. This was another very different style of playing that Oli adapted to and recorded at Bluewater Studios. Oli has also worked on the “Distil” project for three years, both performing and composing. Distil is a project to give composers an opportunity to share their work with other musicians and the general public. This Project inspired Jo Freya (creator of Komposit) to create a similar kind of project with a professional recording aspect.